Relax and unwind onboard the Grandeur of the Seas as she sets sail into the sunset. The Grandeur of the Seas is an integral part of the Royal Caribbean Cruise Line fleet along with her sister ships such as Legend of the Seas, Oasis of the Seas, Radiance of the Seas, Allure of the Seas, and Voyager of the Seas. Royal Caribbean’s extensive fleet is a favourite of Australian cruisers and it’s no wonder why. 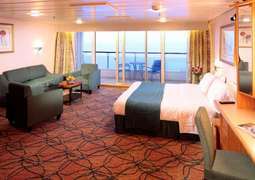 These ships are forerunners in the cruise industry and the Grandeur is no different. 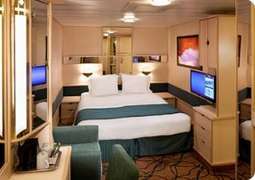 The Grandeur of the Seas boasts a variety of cabin types for passengers to choose from. Each of the 2446 guests can expect to feel like an honoured guest in a cosy inner cabin, an outer cabin, or a spacious balcony cabin with sweeping views. Additionally, there are a number of suite types available, each with unique quirks to suit the personality of the individual. 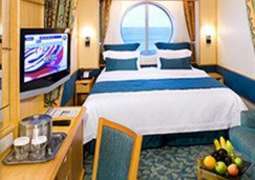 Aboard the Grandeur of the Seas you can choose between inner, outer and balcony cabins, as well as different suites. All of the cabins are so comfortable that you might not want to leave them. Various restaurants, cafés and bars are open all day to satisfy your appetite. Join us on a culinary expedition and experience the best that international cuisine has to offer. 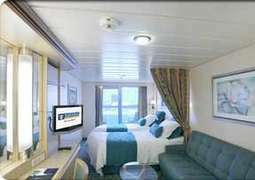 One thing is for sure-- you will not get bored on board the Grandeur of the Seas! Enjoy spectacular shows in the theatre or try your luck in the casino. If you prefer a quieter pastime, why not relax in one of the many bars? The Adventure Ocean club offers lots of fun and games for children and teenagers. Work up a sweat or simply relax in the Spa or Fitness Centre. You could also burn off some excess energy on the athletic track and climb to new heights at the climbing wall. The boutiques on board the Grandeur of the Seas offer jewelry, clothing, perfumes and souvenirs. Internet: Internet access is available for a fee.